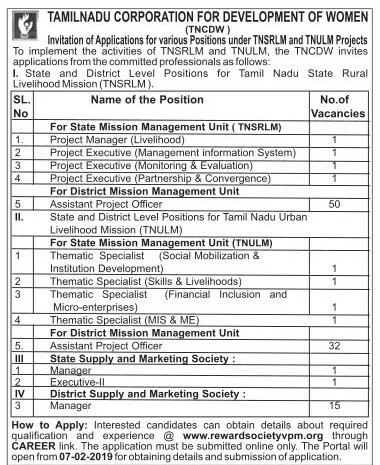 TNSRLM Recruitment 2019 - TNSRLM invites Online applications for recruitment of 106 Project Manager, Assistant Project Officer, Thematic Specialist, Manager, Executive- II Posts. The applicants are requested to apply online only through Official Website http://rewardsocietyvpm.org on or before 13.02.2019. Interested candidates are requested to peruse the advertisement regarding the process of Examinations and Interview, Eligibility Criteria, Application Fee, How to Apply, Pattern of Examination, Syllabus, Question Paper, Admit Date, Exam Date, Result Date etc,. Refer thoroughly before applying. Two year full time Post graduate diploma in Management / MBA (or) Masters in any other relevant discipline with 5 years of experience in Community Development (or) Graduate from government recognized institutes with 8 years of experience in Social Development work with poverty reduction programmes of considerable size and scale. Two year full time Post graduate diploma in Management/ MBA (or) Masters in any other relevant discipline with 5 years of experience in Community Development (or) Graduate from government recognized institutes with 8 years of experience in implementation of skill training and placement programmes with considerable size and scale. Two year full time Post graduate diploma in Management/ MBA (or) Masters in any other relevant discipline with 5 years of experience in community Development (or) Graduate from government recognized institutes with 8 years of experience in dealing with credit linkages, social security and/or micro enterprises promotion in poverty reduction programmes financial institutions. 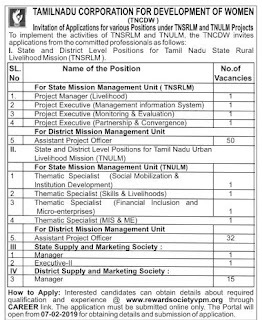 TNSRLM may follow the following process to select the candidates. Eligible candidates can apply online through the Official website http://rewardsocietyvpm.org from 19.01.2019 to 18.02.2019. Before applying, Candidates should ensure that they fulfill the eligibility criteria as per published in the online advertisement.